The World’s Best Bingo game is now on Kindle! Play our free and fresh Bingo game on Kindle with your friends. Bingo Bash has more than 2 MILLION users playing every day with amazing gifts, unique rooms and wild power ups! Whether you call it Bingo, Tambola or Housie, it’s got features that no other game can beat. 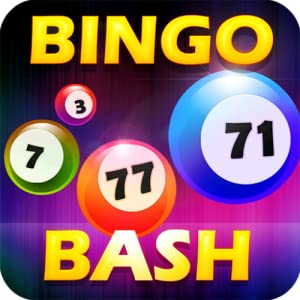 Do you want to know more about Bingo Bash? The wait for the Bingo madness to begin is over. You can play our game from practically anywhere in the world almost instantly. It’s practically bingo heaven in your pocket! The game is interactive, live and you can play with millions of players or just invite your friends and share a bingo experience. It goes on and on for several paragraphs, click above to read more. Brings back memories of playing Bingo with my Mom at the local community center each Friday as a teenager. Loved the game and the choice of specific cards, the camaraderie between players (and secretly cursing them for calling bingo). Bingo Bash is a complex offering with multiple rooms and a ‘system’ that requires bingo chips to procure cards; each separate room more expensive than the last for cards. The beginning room ‘costs’ 1 chip per card, the next 3 chips, another 4 chips and so on. You can play four cards per room and the numbers are ‘called’ in faster increments per room. There are power-ups, that give you special features for the cards and numbers, such as freecells/numbers, double ‘money’ and the rare ‘free bingo’. You get a certain number of free chips per day, depending on if you have gathered the 12 special tokens in each room, giving you additional 4 chips per day. The game does not give you both chips and tokens or special feature bonuses, for those, you must pay out of pocket for anything additional per day/game/etc. The free game is good for about 10-15 minutes per day of playing, depending on which room you are playing in. Any longer, be prepared to fork over a lot of money. I would give 3 stars.